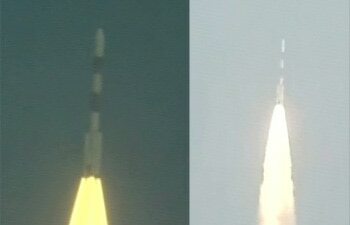 2.38 pm: Indian rocket carrying the country's first Mars orbiter on Tuesday took off from the launch pad at the Satish Dhawan Space Centre here in Andhra Pradesh. Exactly at 2.38 p.m., the rocket -- Polar Satellite Launch Vehicle-C25 (PSLV-C25) --standing around 44 metres tall and weighing around 320 tonnes hurtled towards the heavens with orange flames fiercely burning at its tail. The total project cost is around Rs.450 crore with the rocket costing around Rs.110 crore, orbiter around Rs.150 crore and the balance spent on beefing up the ground support and tracking systems. Space scientists at Indian Space Research Organisation's (ISRO) rocket mission control room were intently watching the rocket escaping the earth's gravitational pull with a one-way ticket. 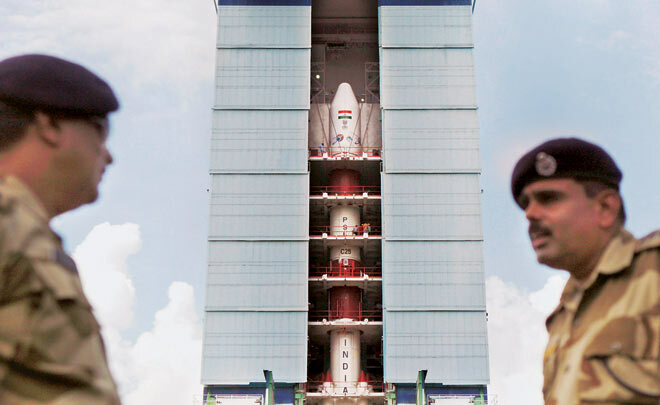 India launches Mangalyaan, Rs.450-crore mission to Mars, from Sriharikota spaceport in Andhra Pradesh. The heat shield had separated as scheduled and the mission was on track, an ISRO official said. 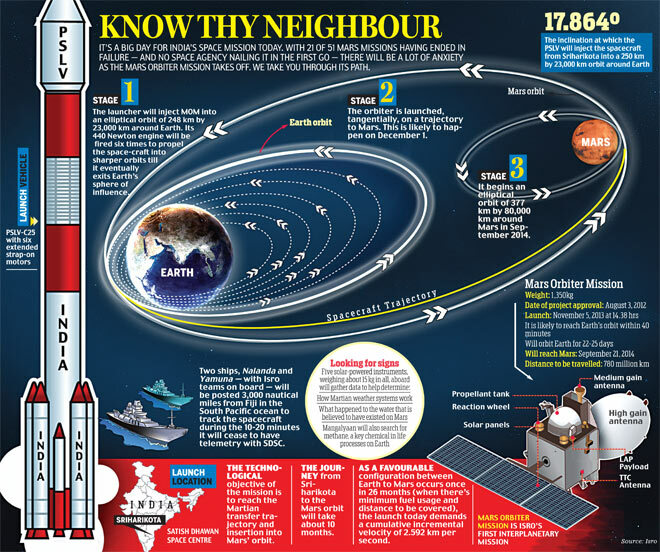 The PSLV-C25 rocket is expected to spit out its only luggage, the 1,340 kg Mars orbiter. The entire flight sequence -- lift-off to the satellite ejection -- will take around 44 minutes -- nearly double the time of normal PSLV rocket missions. India began its space journey in 1975 with the launch of Aryabhatta using a Russian rocket and till date, it has completed over 100 space missions. US Ambassador to India Nancy Powell is in India to witness the launch of the Mars mission from Sriharikota in Andhra Pradesh. Soon after arrival, she left for the spaceport, about 100 km from here. 14.05 pm: ISRO chairman Radhakrishnan arrives at mission control center. 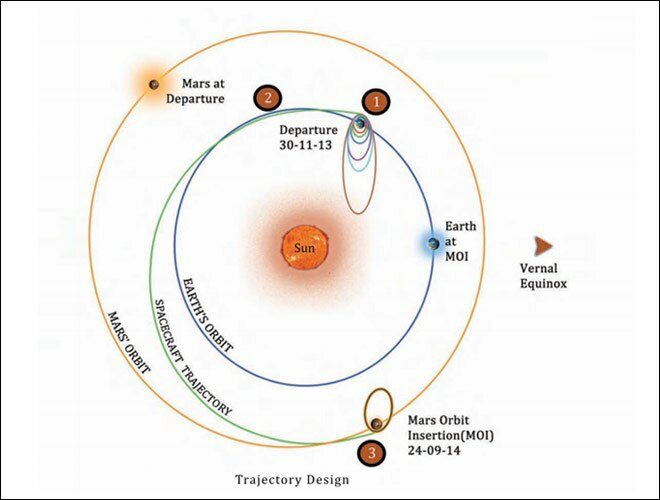 12.29 pm: NASA spacecraft MAVEN to enter Mars orbit the same day as India's orbiter in September 2014. 11.54 am: All vehicle systems switched on. The countdown for the launch started at 6:08 hours (IST). 11.40 am: Second Stage (PS2) Propellant filling operations completed. 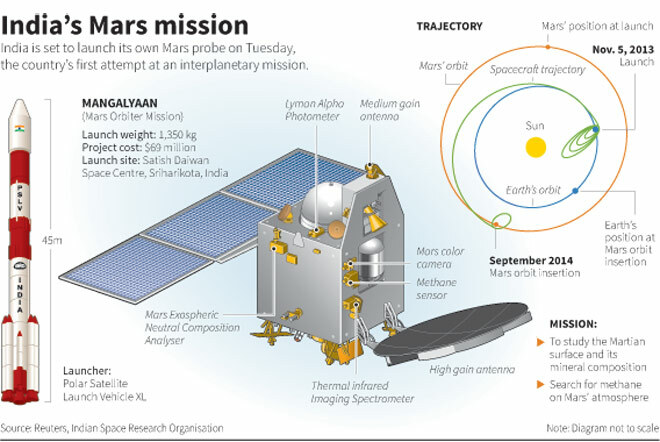 India's space ambition made a giant leap at 2.38pm on Tuesday - mangalvaar, the day of planet Mars. The country's first mission to the red planet lifted off from the Satish Dhawan Space Centre at Sriharikota in Andhra Pradesh with the Mars Orbiter on board, along with other scientific equipment. If all goes according to plan, this will also push India into a very small club of nations with interplanetary travel capabilities. The nine-month long journey, after the Orbiter goes around Earth for 22-25 days, is scheduled to enter Mars' orbit on September 24, 2014. The Mars Orbiter will observe the physical features of Mars and conduct limited study of the Martian atmosphere as finalised by the Advisory Committee on Space Sciences. The pay loads include Lyman Lpha Photometer to measure the relative abundance of deuterium and hydrogen from Lyman-alpha emission; Methane Sensor for Mars to measure methane in the Martian atmosphere, and thus determine past existence of life; Mars Colour Camera to capture images and information about the surface of Mars and its composition; Mars Exopheric Neutral Composition Analyser, which is a spectrometer; and Thermal Infrared Imaging Spectrometer to map surface composition and mineralogy of Mars. On Monday, officials at the SDSC were busy conducting mandatory checks and preparations for propellant filling operations of Second Stage (PS2). "On Sunday, we completed a host of operations, such as, propellant filling of PS4 stage and RCT; filling of Mixed Oxides of Nitrogen (MON); filling of Mono Methyl Hydrazine (MMH) and Reaction Control Thrusters (RCT). 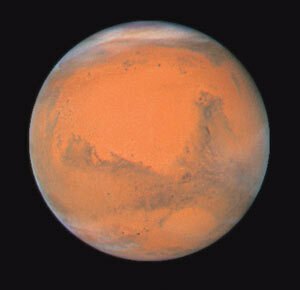 The Mars Orbiter Mission is on schedule," a senior official from SDSC said. The Rs.450-crore Mars Orbiter Mission is India's first interplanetary mission to planet Mars with an orbiter craft designed to orbit Mars in an elliptical orbit. The project, built over a remarkably short period of two years, is primarily a technological mission considering the critical operations and stringent requirements on propulsion and other systems of the spacecraft. Just 21 out of the 51 missions launched to Mars by different countries have been successful and that too by only three space agencies - NASA, European Space Agency and the Russian Federal Space Agency (better known as Roscosmos). ISRO's success will put India into a league China tried, and failed, to enter last year. Japan's Mars mission had failed too in 2003. The success of the Mars Orbiter Mission, therefore, will also make India the only Asian nation to have achieved the feat. But Isro is quick to dismiss any talk of the mission being about an Asian space race. "One of the main objectives of the first Indian mission to Mars is to develop the technologies required for design, planning, management and operations of an interplanetary mission. The technological objective include design and realisation of a Mars orbiter with a capability to survive and perform Earthbound manoeuvres, cruise phase of 300 days, Mars orbit insertion /capture, and on-orbit phase around Mars; ensure deep space communication, navigation, mission planning and management," a spokesperson for the mission pointed out. Can a country with millions of poor afford to spend Rs.450 crore on a Mars exploration mission? India's ambitious Mars Orbiter Mission has sparked a heated debate on the utility of the project, with even Isros own former chairman G. Madhavan Nair terming it a "national waste". "Not only Nair, even (development economist) Jean Dreeze made the same argument. Do we need an MOM at the cost of Rs.450 crore when we have children dying of malnutrition and rural sanitation remains a distant dream? Space quest is understandable for advanced economies. May be our priorities are wrong," said development economist Dr G. Neginhal. Isro officials, though, beg to differ. "ISRO is pursuing specific objectives, as the government provides aims and goals to different departments. It is wrong to compare two different issues," a spokesperson said.